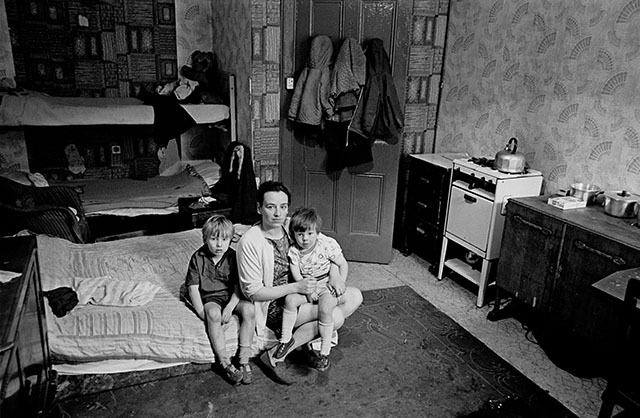 Photographer Nick Hedges took more than 1,000 images for Shelter between 1969-72. Hedges has agreed to lift a 45-year ban on use of the photos in Scotland, a restriction he imposed to protect the identity of his subjects. The photographer says he wants to meet the people again and revisit the areas he photographed. Launching the project on 21 October, Hedges said: ‘It would be wonderful to meet the children I photographed all those years ago and to hear their stories. The photographer added: ‘When I was commissioned by Shelter to take these photographs, I never imagined that decades later they would still have such impact – none more so than on me personally. ‘The poverty and terrible conditions witnessed shocked me to the core. Shelter has told Amateur Photographer that it is not yet ready to release information about the people who have come forward. Commenting on the project, Shelter Scotland’s director Graeme Brown said: ‘These photographs are a sobering piece of history not only for Shelter Scotland, but the nation as a whole. ‘They show us how far we have come in providing safe, secure and affordable housing to the people of Scotland, but also that we must do more for the tens of thousands of families and individuals still desperate for a home to call their own. Some of Nick Hedges’ photos are on show in a free outdoor exhibition at St Andrew Square, Edinburgh until tomorrow.